PHUKET: “When I turn 70, in a month’s time, I’m going to be a full-time artist. I’ll still paint people I see on the beach,” says Mom Luang Tridhosyuth Devakul, better known as Mom Tri, the owner of the eponymous Mom Tri’s Villa Royale in Kata Noi. Dineke Derksen, Leo Musch, Mom Tri and his wife Tam. Glimpsed through the trees at his luxurious house on the headland at the resort, the sea off Kata Noi Beach glitters in the afternoon sun, forming an inspiring vista in front of us. Mom Tri is relaxing with long-time friends and artists, Leo Musch and Dineke Derksen, who have called into Phuket on their way home to the south of France from exhibiting in Beijing. As well as catching up with an old friend, they are here to enjoy the opening of his exhibition of paintings, Bodies on the Beach at Mom Tri’s own VR Gallery and coffee house just next to the resort, where bright paintings depict men running on the beach and splashing in the sea. around his open-plan house, which is filled with free-flowing breeze from the sea. “I am a sculptor basically. These sculptures were done over the years when I had time,” he says. Mom Tri says the early sculptures were inspired by the hippies who were some of the first outsiders to discover the natural beauty of Phuket’s beaches. They often went about naked. He says at that time a beach was considered to be crowded when there were two or three people on it, meaning it was time to move on to the next, empty one. “I loved to sit in front of the Boathouse during the New Year when young people would come wearing very little to hide their beautiful bodies,” he says. This remarkable man is very much a Renaissance all-rounder. Graduating as an architect from prestigious Harvard University, Mom Tri designed many projects, such as the Prem International School in Chiang Mai and the Boathouse in Kata, which he built and owned until recently. He is also a businessman, developer, artist and a promoter of culture in Phuket. “I am not going out to improve the cultural scene. I’m just doing what is enjoyable, just doing my bit and hoping that others will do more. “But there is still very little culture in Phuket. I contribute and I have been doing that for years, without much else happening. “Even Thai culture has more or less disappeared from Phuket,” he says regretfully. For 25 years, the annual Baan Kata Arts Fest was held at Mom Tri’s beach house before it became Villa Royale. Eminent musician Mom Luang Usni Pramoj, who recently played viola with his quartet at the Villa Royale, used to perform regularly at the Baan Kata Arts Fest. “The Government seems to think that tourists are not interested in culture, only in beaches and the bars. So there is no funding for culture. But people always come to my events,” says Mom Tri. And with that thought, our interview comes to a close. Mom Tri is ready to open his new exhibition. It’s yet another of his events in the cultural life of an island he knows so well. – ML Tri’s first architectural work on Phuket was Club Med. He was also architect and/or developer of Le Meridien Phuket Resort, Royal Phuket Yacht Club Resort (1986, at Naiharn Beach), Tri­sara, Villas Grand Cru (near the top of the hill between Kata and Chalong) and Mom Tri’s Kitchen in Kata. Baan Kata, designed and developed by him, was Phuket’s first upmarket property development (c1997). Houses there sold for a massive B10 million! They now sell for almost 10 times that amount. 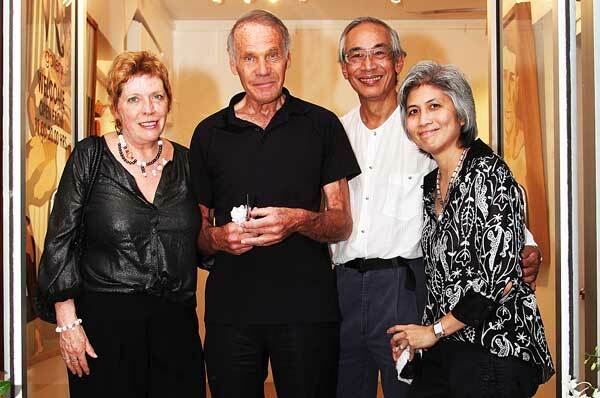 – He is a close friend and collaborator with writer William Warren, who has written dozens of books on design and architecture in Thailand (mostly coffee table books). Mom Tri was also the publisher of Warren’s book Prem Tinsulanonda, Soldier & Statesman. discussed their work and how they went about it. These regularly drew crowds of 50 or more (mostly Westerners). Mom Tri’s interests in Phuket now include Mom Tri’s Kitchen and Mom Tri’s Villa Royale. There are now plans to open a new restaurant at Villas Grand Cru in Chalong.